Adele has almost 20 years experience in marketing research having worked in media agency, media owner and research agency roles during that time. 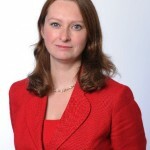 She joined LRW in January 2014 having spent the previous 5 years at YouGov heading up the company’s 5 core consulting sector verticals: Media, TechTel, Financial Services, Consumer and Public Sector. At LRW, Adele manages its European arm and is responsible for the company’s growth and development this side of the Atlantic. Adele has an MA in Social and Political Science from Cambridge University.